These days, there is a lot of talk about “green technology:” technology that can make improvements to sustainability, green building, energy, and more. So then why is mechanical insulation considered a “forgotten technology” when it contributes significantly to all of those areas? In fact, did you know that mechanical insulation is one of the few industrially manufactured products that saves more energy over its lifespan than is required to manufacture it? What’s more green and modern than that? Why is mechanical insulation called the "forgotten technology?" 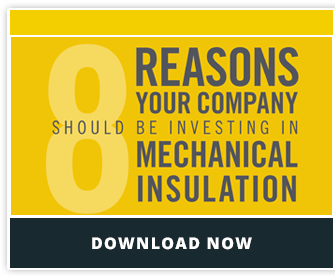 10-30% of all mechanical insulation is missing or damaged within 1-3 years of installation. In a 4-year mechanical engineering program, less than 1 hour is spent on thermal insulation. The reduction in knowledge of the trade has led to underutilization; it is often “value engineered” as part of a mechanical contract. It can be easy to forget about—there are no knobs, buttons, gauges or computer monitoring and it’s often out of sight, out of mind. LEED and other green rating systems don’t currently allow mechanical insulation to be used on a standalone basis for credits. The innovations in thermal insulation are really pretty amazing when you stop to take a look. For instance, aerogel insulation, which is used by 24 of the world’s top 25 refineries worldwide, was first developed in its modern form by NASA for use on the space shuttle. Now this technology is available for industrial applications and is considered one of the most effective insulation materials on earth. Easily specified, installed and maintained to maximize efficiency and productivity: it’s time to think about insulation differently. It’s time to bring it back from being a “forgotten technology” and bring it into the forefront of modern energy saving technologies where it belongs. If you want to create a green and modern facility, insulation is the perfect place to start.